In a report released today, Amnesty International criticized the Qatari government for continuing to drag its feet on reforms and failing to urgently address the rampant exploitation of migrant workers. highlights the disparity between the reforms promised in May of this year and the very minimal progress thus far. Following a series of exposés on the abuse of the country’s labor migrants in 2013 and 2014, Qatar commissioned international law firm DLA Piper to review the situation and offer recommendations for reform. Though the report is available widely, the government did not make it public. However, Qatari officials did announce reforms on 14 May, 2014, including changes to the Kafala system. Prior to Qatar’s announcement in May, the UN Special Rapporteur on Human Rights and Amnesty released reports on the exploitation of migrant workers, and provided recommendations. 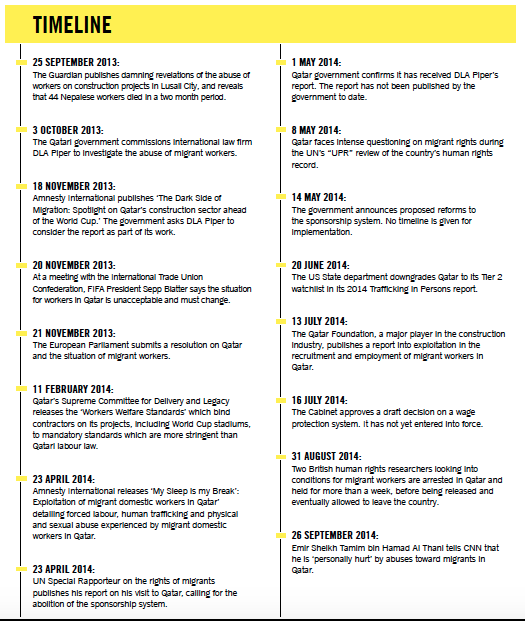 In its latest report, Amnesty lists nine key issues, highlighting actual progress against the recommendations made by Amnesty, UN and DLA Piper. Of the nine, there has been no actual progress on five, partial progress on two and limited progress on two, as listed below. Issue 1: Migrant workers are prevented from leaving the country by their employers, who deny them exit permits and confiscate their passports. Issue 2: The restrictive sponsorship or “kafala” system gives rise to abuse including forced labor. Issue 3: Domestic workers have no protection for their labor rights under the law, and can suffer physical and sexual violence at the hands of their employers. Issue 4: Migrant workers are paid late or not paid at all. Issue 5: Workers pay large recruitment fees to migrate to Qatar and /or are made false promises about their salaries or type of work. The abuse can amount to human trafficking. Issue 6: Conditions on-site for construction workers are harsh and dangerous. Workers face barriers to accessing health care. Many workers die of heart attacks. Issue 7: Access to justice for victims of labor exploitation is difficult, time-consuming and expensive. Issue 8: Migrant workers are forbidden from forming or joining trade unions. Issue 9: Labor standards, including accommodation, are not enforced properly. There are not enough inspectors and inspection is not stringent. “Time is running out fast. It has been four years since Qatar won the bid to host the World Cup, putting itself in the global spotlight, so far its response to migrant labor abuses has not been much more than promises of action and draft laws,” said Sherif Elsayed-Ali, Head of Refugee and Migrants’ Rights at Amnesty International, in a press statement.